Could Wood Plastic Composites Motivate More Investments in Climate-Friendly Anaerobic Digestion? Picture this future scenario: it’s a hot summer day and you are sitting with some friends on their deck enjoying a cold beverage. You notice they recently replaced their deck and, interested, you ask about the decking material they used, only to find out that it’s made partially out of . . . manure from dairy cows! Surprised? Work done by researchers at Washington State University investigated this potential method for adding value to an agricultural waste product. Figure 1: Anaerobic digestion has the potential to turn dairies from a source to a sink of greenhouse gases, but capturing value from co-products is critical for economic viability of anaerobic digestion. Photo: Darrell Kilgore, CAHNRS Communications. Anaerobic digestion (AD) of dairy manure has potential to generate renewable energy, improve the bottom line for dairy farmers, and turn dairies from a net source to a net sink of greenhouse gases (Kruger and Frear 2010; Figure 1). A previous post explored the benefits of AD technology and an article from WSU’s Center for Sustaining Agriculture and Natural Resources discussed the cost of AD. The economics of AD depend on a number of factors, including whether a use—and a market—exists for the large quantities of digested fiber that remain after the process. Typically, this fiber is either reused as bedding either on-farm or elsewhere, or composted for use as a soil amendment. Other methods for adding value to AD fiber include using it as a feedstock for biochar (Ayiania 2019) or as a substitute for peat moss in container plant systems (Palaez-Samaniego et al. 2017). Use of AD fiber as a peat moss substitute has even reached a commercial level. Research from the lab of Dr. Manuel Garcia-Pérez at Washington State University examined yet another potential use for this fibrous product: as an ingredient in wood plastic composites. The particle size and geometry of fibers from digested dairy manure make it a suitable substitute fiber for engineered wood products, specifically products called wood plastic composites (WPCs), which are widely used for decking and have experienced market growth in recent years. One factor limiting use of WPCs in wet places like Seattle or Portland is their tendency to absorb water, which reduces their strength. Somewhat ironically, steeping the fiber in hot water (called hot water extraction), changes its composition and improves moisture resistance. The question is, will this translate to beneficial changes in the properties of the WPCs? Gabriela Pereira-Ferraz, a former graduate student in Dr. Garcia-Pérez’s research group, compared samples of WPC made from Eastern white pine wood “flour” (a standard fiber used in WPCs) to those made from AD fiber, in its original form, and AD fiber treated by hot water extraction. The researchers created sample boards from each of the fibers and investigated specific mechanical properties of the WPCs that are important for their functionality, strength, and water resistance. After the AD fiber was treated with hot water extraction it lost 21% of its mass, and researchers observed changes in its surface structure, which became rougher (Figure 2). The structural changes resulting from hot water extraction led to improvements in mechanical properties and water resistance of the resulting WPC material. To test water uptake, samples of the WPCs were immersed in water. Treating the AD fiber reduced moisture uptake by 39.1%, and swelling by 36.0%, after 127 days of water immersion. Though decking material would not typically be immersed in water for 127 days, this type of laboratory testing exposes materials to conditions more extreme than what they might experience while in use. The 39.1% reduction in moisture uptake, for example, does not necessarily translate to water uptake by these materials if used on your deck, rather the results of laboratory tests allow researchers to compare the properties of different materials. Another property measured was “strain at break,” a measure of how much strain is applied to the material in a controlled laboratory setting before the material breaks. Hot water treatment improved the strain at break measurement by 15%. On a practical level, this means that hot water extraction produced a stronger composite material than AD fiber that had not undergone hot water extraction. AD fiber that underwent hot water extraction was more water resistant than pine and performed as well or better than pine fiber for three of four mechanical properties measured. These laboratory results are promising. However, in order to move this end-use for AD fiber to commercialization, more work needs to be done to evaluate the economics of scaling up the process. Wood plastic composites may offer another way to add value to fiber from anaerobic digestion of dairy manure, further improving the economics of these systems. 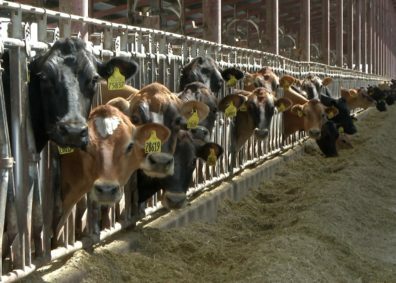 Increased use of anaerobic digestion for dairy manure would be a net benefit from a climate change perspective. Developing feedstock for WPCs from AD fiber would therefore be good for both the climate and for the dairy farmer’s bottom line. For more information on this project and others funded with Biomass Research Funds from the Washington State University Agricultural Research Center, please see the report: Technology Research and Extension Related to Anaerobic Digestion of Dairy Manure 2015-2017 Biennium. Pereira-Ferraz, G., Frear, C., Pelaez-Samaniego, M.R., Englund, K. and García-Pérez, M. 2016. Hot Water Extraction of Anaerobic Digested Dairy Fiber for Manufacturing Wood Plastic Composites. Bioresources 11 (4): 8139-8154. Pereira-Ferraz, G., Frear, C., Pelaez-Samaniego, M.R., Englund, K., and García-Pérez, M. Production of Composite Materials from Anaerobic Digestion Fiber. 2017. Chapter 7 in: Technology Research and Extension Related to Anaerobic Digestion of Dairy Manure 2015-2017 Biennium. 2017. Compiled and edited by Hills, K., Hall, S.A., Saari, B., Zimmerman T. A Project Report for the Washington State University Agricultural Research Center and the Washington State Department of Agriculture. 173 pp. Ayiania, M., Carbajal-Gamarra, F.M., Garcia Perez, T., Frear, C., Suliman, W., and Garcia Perez, M. 2019. Production and characterization of H2S and PO43- carbonaceous adsorbents from anaerobic digested fibers. Biomass and Bioenergy 120:339-349. Kruger, C.E., Frear, C. 2010. Lessons Learned About Anaerobic Digestion (Chapter 12). In Kruger, C., G. Yorgey, S. Chen, H. Collins, C. Feise, C. Frear, D. Granatstein, S. Higgins, D. Huggins, C. MacConnell, K. Painter, C. Stöckle. Climate Friendly Farming: Improving the Carbon Footprint of Agriculture in the Pacific Northwest. CSANR Research Report 2010-001. Washington State University: http://csanr.wsu.edu/pages/Climate-Friendly-Farming-Final-Report/. Palaez-Samaniego, M.R., Humel, R.L., Liao, W., Ma, J., Jensen, J., Kruger, C., and Frear, C. 2017. Approaches for adding value to anaerobically digested dairy fiber. Renewable and Sustainable Energy Reviews 72:254–268. This entry was posted in Uncategorized on January 24, 2019 by sonia.hall.